A writer and blogger, among other things, in the Cleveland area. There’s been some hoopla this summer in Cleveland regarding proper licensing, especially for transient vendors. With Holiday Event/Show Season upon us, it seemed a good time for this discussion. As Creatives, we are running businesses. As such, we take in monies (hopefully) from sales. By law, we are required to pay taxes. That is just the way things work. Those working for organizations show up to work their scheduled hours and receive a paycheck itemized with quite a few deductions. Taxes are deducted. Creatives work differently; it’s on us to come up with a system to track expenses, receipts, sales, and to consult professional accountants/attorney’s if need be. That is all part of running a business. If we don’t know, it’s on us to learn the rules, and the laws. Because that is how professionals operate. As such, when we take our businesses out to the public, to promote/sell product, we should do so in a proper, professional manner. Yes, I’m an artist. But I’m also a professional woman, running a creative business. To show up at an event without proper credentials, and then to complain, argue, and cause a stir. This is NOT the right look for any business. Doing so only shines a spotlight on a creative for being unprepared, makes a person/business look foolish, annoys other vendors, and organizers. Children show up to play a baseball game without a mitt, then throw a tantrum. Adults do not. Our creative businesses are no different. We are accountable to the rules/laws that apply to our businesses, just as other organizations are. As non-profits, government entities, private organizations have guidelines to follow, so do we Creatives have our own set of guidelines. Obviously, it’s impossible to know everything—and to show up once without proper paperwork or to have some type of mishap… that’s probably going to happen. There is a learning curve. All we can do is apologize, and clean it up the best we can. BUT from there on, we should know the rules, the way the game is played. To continue trying to get away with something is unprofessional and childish. It only serves to make things difficult for organizers, those killing themselves to put on an event. They already have more to do than they can possibly manage. And they have spent considerable time laying the groundwork for us ALL to shine at events. Get on board. Or don’t. But expect that being an artist/creative doesn’t preclude you from having guidelines to follow, rules and regulations to adhere to. Anybody else got anything? Advice? Learning Experiences? Links to Resources? I’d never discourage anybody, because the rewards are great. As I grow, the questions keep coming, often from those in creative businesses. I thought some honesty might be in order. Expect to spend time creating art, or your chosen creative product. Products need packaged, will require bags, tissue, tags, and often bubble wrap, boxes, and other materials if they need shipped to customers. Expect to spend far more time on branding, marketing, not just building—but constantly maintaining a website, building social media reach, creating social media content. Then there are the business tasks; tax forms, vendors’ licenses, insurance, accounting, managing expenses/receipts, tracking sales/analytics, strategic planning to lay groundwork for future growth, and so much more. Those doing events/shows can expect to network, apply to shows, and communicate with event planners regarding payment, setup, teardown, and rules/regulations for event. Every event is different. Does the venue require white tent? Are you required to rent white tent/tables from them? Will you accept cash only, or bring a card reader/tablet? Is there power to keep devices charged? There is learning. I’m currently doing “Like a Boss” a course offered by Amy Cseh, of Schoolhouse Salvage with online modules, twice weekly conference calls—with a group of creatives from across the United States. There is no success for those who don’t invest in learning. I often do online tutorials, and am always reading a book, looking for ways to improve my business. Starving artist (definition): An artist who sacrifices material well-being in order to focus on their artwork. They typically live on minimum expenses, either for a lack of business or because all their disposable income goes toward art projects. Everybody knows the term starving artist. Many fail to address the above issues; they do not run their Art Business as a “Business”’ and they WILL starve if they pursue art as their primary career. Seriously, if you are an Artist—then you have an Art Business. Unless your goal is to have a hobby. I have a day job; because I really enjoy my job, but also because I enjoy having medical benefits. My hours are 7:30-3:30 and there are many other upsides that allow me to continue with my art. I’ve tried many variations, but the current one is the best for me. Me at the beach, looking “put together” after being hit by a wave. Again. Sometimes I stop at the drive thru for dinner; sometimes that happens with too much frequency. Sometimes I miss days of exercise. There are Saturday nights I stay in, create art, or attend to the many items needing my attention. Sometimes too many in a row. Being an artist can be solitary, lonely at times. There are many days I wonder WHY I do it, why I put myself thru it, think there is SURELY an easier way, a better use of my time? And then the art grabs me again, with an invite to a big event, a great week of sales, a lovely write-up online, a custom order so near to my heart, I desperately want to do it for free. And I fall in love with my art all over again. At the moment, I’m single. Not because there aren’t single fellas to date out there, but because my schedule is packed. Between work, my children, family/friends, my art business, and art events, I almost can’t squeeze one more item into my schedule, and dating falls off the list. If I’m being honest, my “dream man” is a guy with barn full of tools; table saw, miter saw, cordless drills, tile cutter, biscuit joiner… I could go on and on, really. A truck, pickup or SUV would do—and perhaps some carpentry skills? I also (accidentally) discovered that my dreamboat should like sand. A while back, I talked to, and met up with the nicest eligible bachelor; educated, great job, handsome, a guy who will make the right woman swoon. He wasn’t into the beach, didn’t want to get sand in his toes. And so he and I would NOT work, because there is sand in my car, sprinkled by my sliding door, and sometimes in my art. I bring the beach home with me in the form of glass, metal, driftwood, plastic, and wire. Yep, I’ll be needing a special person to tolerate the sand. And he’ll certainly need to be into the beach. Walking the beach, dragging my finds off the beach, vacationing at the beach with my family. When you see photos of me at an event, or hop on my website to have a look at the art—know that much time, effort, planning, training, and money have gone into my Art Business. And there is far more to it than simply creating art. Interested in learning more? I’m happy to blog about topics other artists have questions about. Contact me, or comment, and I’ll share my experiences. Ever wonder what comes after the mess? Playing with Perfect was born. In the blog, I told stories of the adventure of becoming a single parent, setting up a new household with me (gasp…) at the helm, and the bumpy process of entering the workforce at 38 years old—in an economic downturn, after home values and investments tanked, and when the world didn’t need another “bust out” looking for a job/career. It should have been a complete disaster, but it ended up being really, really fun. Playing with Perfect Part I was quite a ride. I will always value the lessons learned. Part II of Playing with Perfect begins now—in 2017. Another volume, with new stories. The Kids: Are lovely; both in college and they come home for visits. We continue to make memories and I adore the adults they’ve become. Me: I’m still single. (For now…) But I’m far more open to meeting the right person, than I used to be. I’m more established now, have a solid job in downtown Cleveland, own my own home, have a small art business, and the nest is empty. Just me and my trusty dog, Grace. For the first time in my adult life, it’s all about me, and I’m enjoying it. I’ve often joked that it would take quite a fella to drag me into a serious commitment. My Home: In the summer of 2016, I bought a HUD/Bank Owned property. Though most would have seen an oversized outbuilding in disrepair, I saw a cozy cottage—my future dream home. It was in rough shape, but I’m slowly renovating it. Ever so slowly… Far more slowly than I’d planned! I’ll be posting more on this, with photos, for those who wanting to follow the progress. My Art: I’ve lived my whole life in cities along Lake Erie’s shoreline. The beach is my happy, peaceful place. I’ve always walked outdoors, in the woods, and along the beaches of Lake Erie, east of Cleveland; always brought nature indoors in the form of pinecones, leaves, flowers, branches, beach glass, and driftwood. 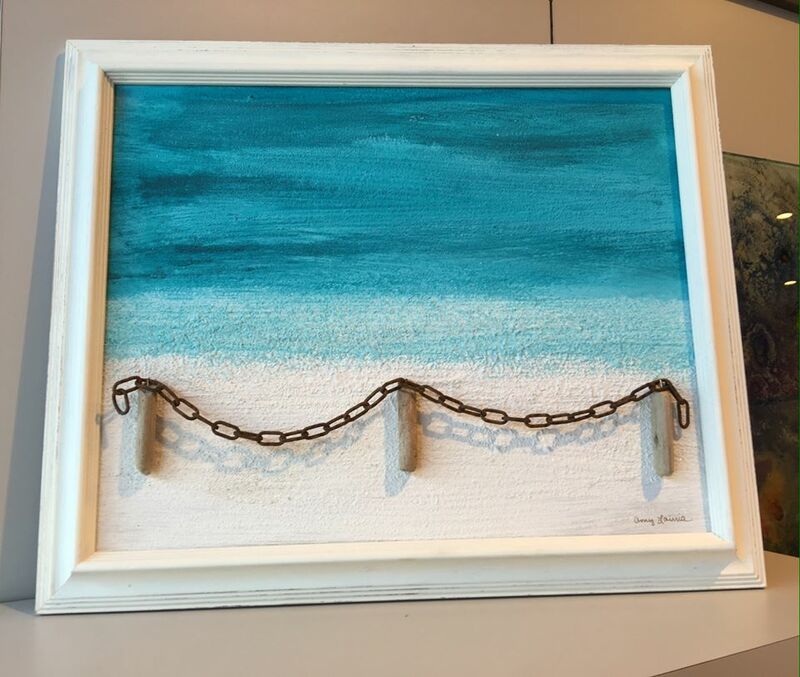 Eventually, my “found objects” made their way onto canvas, housed in antique/vintage frames, and this year onto salvage wood. Did I mention that I adore vintage? That I find ways to repurpose, upcycle anything old? Furniture, frames, vintage jewelry…and apparently homes? Or at least my current home. Art in Cleveland: Over the years art has grown into a small business. With my background in Business/Management, it makes Perfect sense. I’m blessed to marry my creativity with my love of marketing, writing, my college studies, and professional experiences. I sometimes collaborate with Shirley’s Loft on 185th Street in Cleveland, do shows/events around town, but more often sell art online thru my website. My blog posts dropped off as the kids motored through high school, and started college. But I’ve been thinking it would be fun to start writing again, to tell stories of being an empty nester, renovating a home, creating art, being single in my 40s, and (God help me) visits with the adult children. There are so many stories to tell. Turns out there’s life after raising children, after we mop up the messes our younger selves created. Here’s to Playing with Perfect Part II and another new beginning. Not bored indefinitely; just for a little while. A spell of boredom would be lovely. It’s something I find myself getting excited about. My last child just graduated high school, won state at his event in track/field, competed in nationals as a decathlete in North Carolina—and I threw him a graduation party. ALL in June. My eldest just finished her third year of college and is around this summer, working full time at her engineering co-op. My rental house lease is up August 1st. By a stroke of luck or divine intervention, a realtor friend found me a house in a nearby city—and I bought it. (Gasp…) Not quite in the plan. The house is HUD/Bank owned and vacant. It needed inspections; needs love, a good scrubbing, painted, trees cut back, fixtures, appliances, a few windows, etc. And it’s TINY. A little 1 bedroom cottage. This means I have a week or two to get rid of most everything I own, while organizing closing on the house, contractor fixes, getting quotes on homeowners insurance, arranging utilities turned on, and more. Oh yeah, and I need to get my tiny cottage habitable. Darling Daughter will soon begin her fourth year of college. My son is about to start college. He’ll be a decathlete on a track/field team at a D1 school AND a college student. It’s never quiet. Not ever. There are bonfires, movie nights, friends in and out at all hours of the day and night. A new slackline out in the yard. I’ve got an overgrown lawn, too many dogs, no groceries, a basement full of dirty laundry, AND a home in the process of being packed for a move. I’ve got a full time job–am out town for work in both July and August. An artist who desperately needs a haircut, and an exercise regimen. Art isn’t something I looked for, it found me. I’m just along for the ride, meeting people, having fun, and creating with whatever I find outdoors using upcycled frames. I consider myself an accidental artist. Art is an escape from the chaos listed above. When things get crazy, I play with my glass, metal, rocks and sticks. Or I get outdoors; walk in the woods or on the beach—find more inventory (rocks, sticks, glass) to use in my art. I’m wearing my “artist hat” this week. 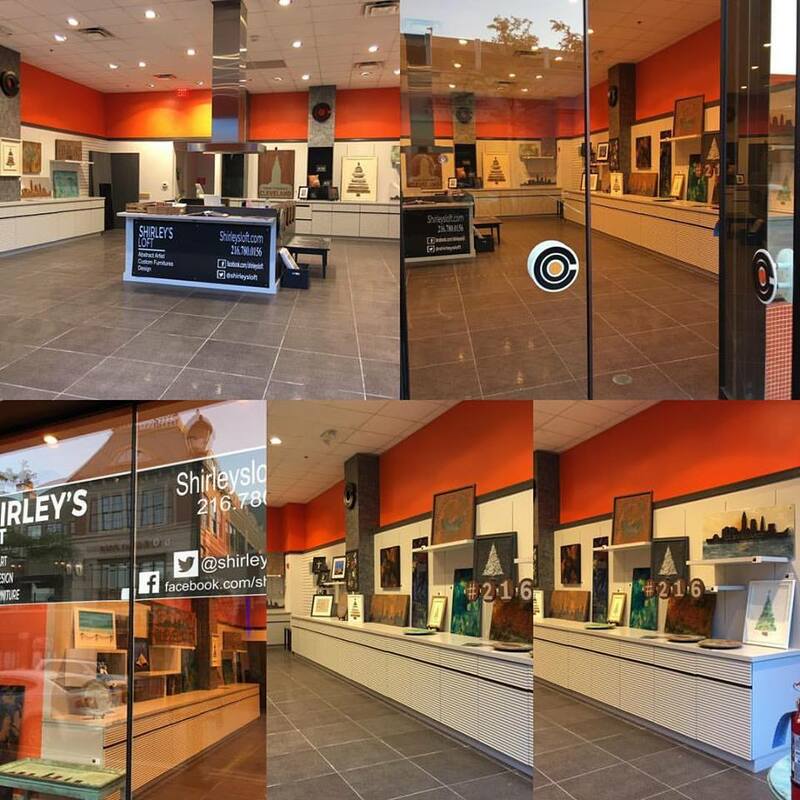 Have teamed up with Shirley Slemc / Shirley’s Loft to have a storefront at Legacy Village. I spent last weekend getting ready, finishing up art, getting photos/copy on our websites, loading a trailer, so that Shirley could get our space looking beautiful. Shirley worked a miracle. It looks great! She’s been there all week. I’ll be there to Friday night and Saturday. I’m thinking of hanging a hammock. I can see myself lounging in the shade, with a toe dangling off the side in the breeze. I’m really looking forward to some boredom. Come on up to Legacy Village this weekend. Shirley and I would love to see you! !